I have been known to be a neat freak from time to time, so I am sure that is why the Lord puts a LITTLE chaos in my life every once in a while. I have a house full of company still and while I am loving every minute of it, I just had to laugh at what my world looks like. I always show you all the pretty pictures, but let's end the year with what it really looks like today. 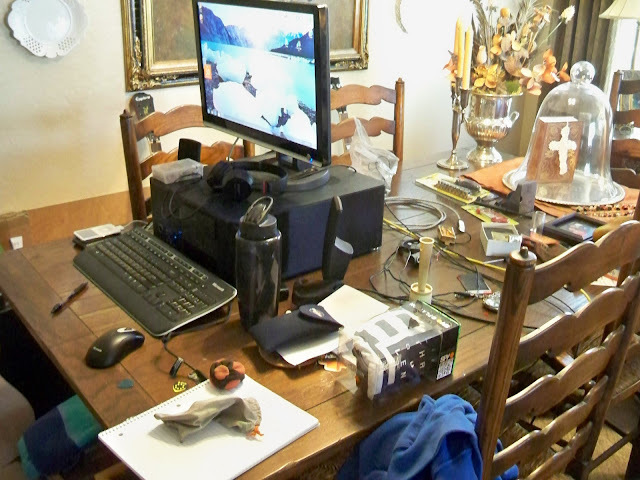 My grandson asked if he could set up his computer, of course I said yes, I just forgot how they spread out and make a mess. Gotta love it. Reminds me when I was raising my boys. The guest room is full, so the grandson put his suitcase and clothes here. 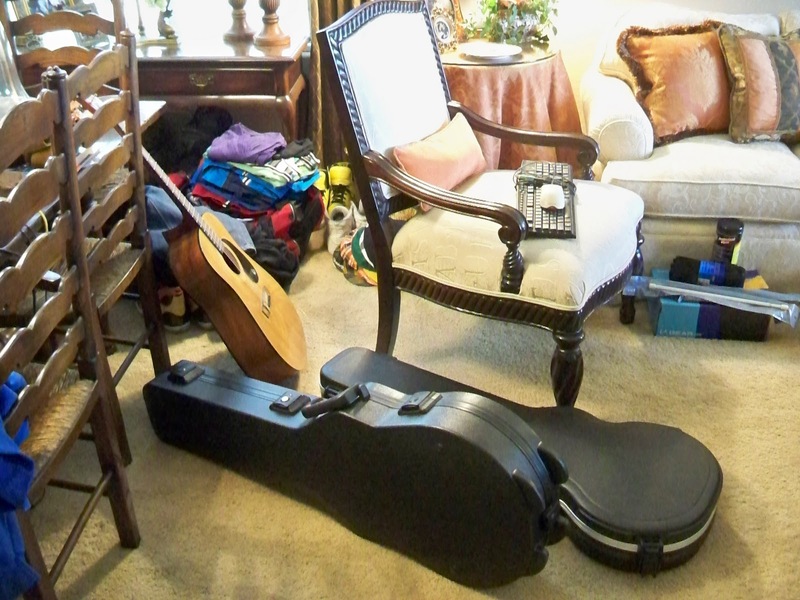 Guitars, clothes, presents and who knows what all. I think the Lord has worked wonders in me, there was a time when this would have definitely driven me up the wall to the point of tears. Now I just thank Him for my family and Praise Him for the mess. As the year ends, I am trying to be Thankful for all the messes in my life this past year, and to Praise and Thank Him for all the wonderful Blessings that I received. I count you all as a huge Blessing and I so appreciate your friendship. I pray your New Year will be filled with Blessings to many to count, Love, Laughter and Health. Hi Marty, I was once a clean freak and any mess would drive me crazy! Now with grandkids I have learned to loosen up. I hope you have a very Blessed 2012! Marty, Thank you for posting a pic of real life! I am a neatnik like you and have trouble when everything is out of sorts. I just sat down to relax for a little bit before my son and his family arrive this evening for a belated Christmas gathering. It will be chaos, but I, too, have learned to love it and will miss it when they leave. Have a blessed new year! Marty Thank you for being real! In truth all our houses right now have messes. Right now there are three plastic storage containers sitting in front of my tree. I plan to take the tree down tomorrow. My floors need a good steaming with the Shark steamer. 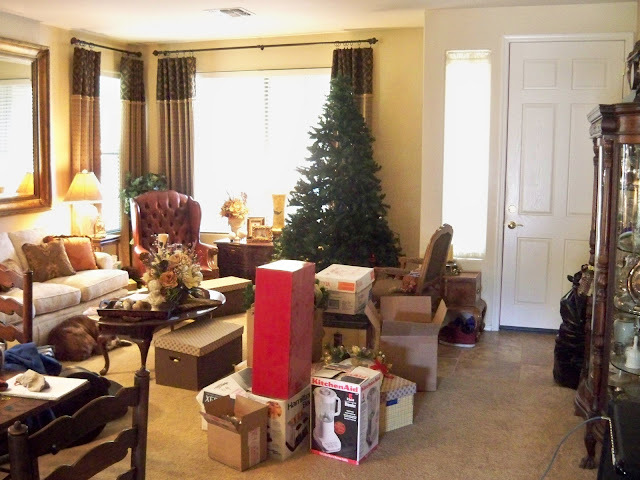 I need to vacuum the bedrooms and take all the Christmas decorations down through out the house. I am praising God with you for all the messes. I'm glad to hear you are embracing the mess, Marty! : ) I went through that while my son was here, although he kept it confined to the guest bedroom. I'd take the mess anytime if it means he'd be here. I used to always stress so much when my house got messy. I have learned over the last few years that the time with my kids and family is so much more important than a perfectly clean house. This year my kids bought me a wall plague that says " Bless this Mess"
It is perfect for my home where family is more important. Thank you sharing your post. I love this post! A mess in our home from time to time proves we all are real people. Also, the mess from our house visitors shows we have people who love us and want to spend time with us. Reminds me of this saying, "Excuse the mess, we're making memories." Praise the Lord! Yep ...we must all learn to count our blessings. Nothing like a house full of people. I wish my home was so full like that over the holidays, but I am counting my blessings that I have Mr. Sentimental. Happy New Year to one special lady! Marty... I used to be same way. I would get all stressed and feel like coming unglued. Praise the Lord...I now see things in a different way. This Christmas, a coke was knocked over and spilled onto my carpet....in the past that would have been a major disaster. Hey .... resolve carpet cleaner did the trick. No worries. Hugs to you sweet lady. I know the feeling Marty. But I am thankful that I have family to make the messes :-) Happy Blessed New Year to you and yours. Praise the Lord, indeed for such a lovely family!In time the house will be quiet and in place and like Mary when Jesus was born and all came to see the Babe...ponder all these things in your heart. These are the joys that will bring a smile to your face in the quietness of their absence! Have a Happy New Year, dear friend! You are blessed to have people at the source of your messes. Happy New Year! Marty, yes, yes, yes! That is so me, I can relate too! I have to say, I'm thankful for each and every mess! They are not messes are they? They are just love sights! Had to laugh Marty as this is exactly what it is like when our boys come for a visit! But like you, I have come to love the mess that comes with those precious men in my life!! My white tree in the blue guest room fell over last night. That tree promptly got packed away. Now the rest of the 6remaining trees....different story- maybe they will fall over 1 by 1 and make me take them down! oh my.. I have had that same kinda stuff all around many times. yes - you'll miss it and its wonderful you are aware of that..
Love is often messy lol..
My place is getting there....but I am so sick of packing up Christmas. I just have the main tree and I am done! Hallelujah! I know you are enjoying every minute with that family of yours!! Enjoy and Happy New Year! Marty, this post was wonderful. I totally understand! From someone who's relatives can't relax and enjoy the temporary mess, I congratulate you for recognizing what is important and working to see the blessing and the positives. Believe me, those around you who are the most important to you will notice and will be grateful they mean more to you than a neat and perfect house. They'll be glad it's a home instead. I have been there too, Marty, many more times than I would care to admit! I have to agree, count your blessings at least you know you have a full, happy house! Our house ALWAYS has that "messy lived in" look, even more so when my family comes to visit. While it can be very nerve wracking, it's so worth it to be able to spend that wonderful time with our loved ones. And there will always be time to clean it all up when they've gone back to their lives. Glad you are able to not stress over the mess and instead enjoy your family! Happy New Year! Marty it was fun to see the 'aftermath' of the holiday. Its just nice to know other people have days where everything is just not perfect either. Sometimes its so intimidating to see homes that looks like no one actually lives there because its so perfect. We all try in our own way and I do think that is all that matters. Sweet daughter and granddaughter just left on Tuesday morning...same thing happened here. Stuff EVERYWHERE! Like you, I am sooo greatful for the mess! Hugs to you Marty and to another great year of blogging with you! Good for you! I have relaxed some since I am getting older. When my daughter was small I know I drove her crazy. I couldn't stand footprints on the carpet,and her room had the most plush carpet you can imagine and showed ever print. She says she felt like she had to "fly" to her bed on wings. Lord, that had to be awful!! Thank God, I got over that (to some extent). Hope you have a wonderful new year. Completely agree about blogging friends being blessings. I can't believe you are already have your Christmas stuff put away. I get today, tomorrow and Sunday to relax and then Monday, I will put everything away. I already told the kids since they were so awesome for getting everything out that I wouldn't bug them to help me put it away. Thanks for sharing your day with us. Happy New Year, and happy blogging. It is amazing, the older I get the less a mess bothers me-it will get cleaned eventually.Life is short and family is more important. I always like to see how people really live. It makes me feel normal. Ha! I sometimes look around at the messes around here (from my boys) and think the same as you. As much as I love a clean home, the messes mean that everyone is enjoying the home and we're all together. That is more important than a clean house! Hope you have a fun new years eve with your family tonight. Your house has never looked more beautiful! Ha, this looks like my house right about now, after having the kids home from school for a couple weeks! Ever surface has something on it, kind of gets to me, but then I remember to be thankful for these messes! Happy New Year Mrty. I don't like mess either but I have rooms like that right now too! I will clean it all away tomorrow! Oh Marty- I am so much like you- I have to remind myself constantly and consistantly that I can PICK UP when the party is over. I like things neat and orderly and it goes against my grain to see it otherwise. God certainly had a sense of humor when he sent us messy grandkids, didn't he? Oh, yes, Marty, we need to be thankful for the "messes" in our lives. I love that you can love the family mess and know that after they leave you can clean. Enjoy them while you can! Be thankdful they come to visit. O'Marty, I can so relate from your house to mine! We have had family with us since the 17th of December and the last of them left yesterday. Now it's quiet and I'm feeling lost!!! Happy New Year to you and your family. Dearest Marty ~ a messy house is the sign of creativity. At least that's how I am looking at things! Keep a smile on your face. Life is good. Thanks for hosting Table Top Tuesday each week and bringing so many of us together. Facilitating friendship is God's work and you have done a great job!! May you and yours experience all of God's blessings in this new year. Thanks for showing us some reality! LOL. Neatness is wonderful for sure but having our family and friends around is the most wonderful of all!! People usually don't remember how clean a home is ..they remember if they had a good time and if it was warm, welcoming and comfortable to be there. I try to always remember this at the holidays...so glad you are making memories and not getting stressed out about it! Happy New Year! !